As part of our preview season for Ixalan, we are going to take a deeper look at some of the cards previewed on our own homepage. Today, we'll be peering behind the scenes of the process that went into creating the design and art of Wakening Sun's Avatar, which was previewed in Mark Rosewater's Making Magic article today. 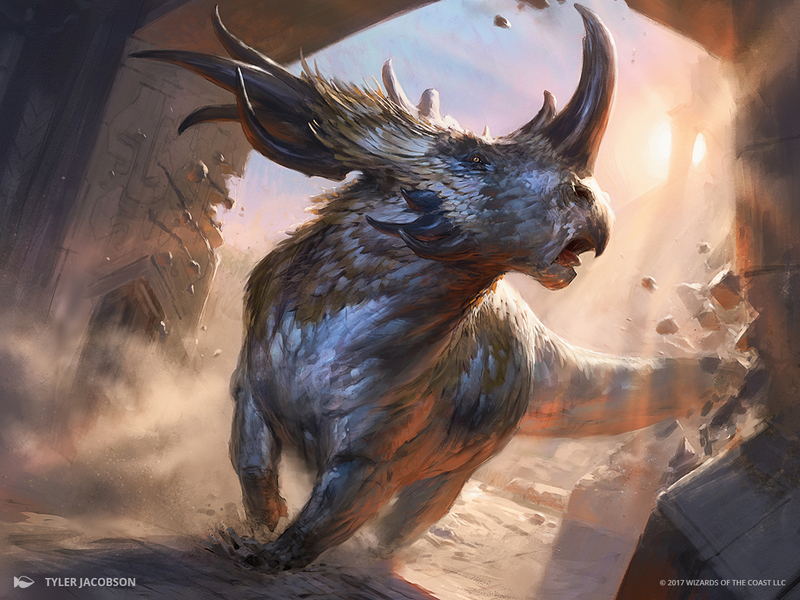 Wakening's Sun's Avatar was one of the first Dinosaurs that R&D designed. From the start, the set team knew that they would want a big, board-clearing effect for a mythic rare Dinosaur. After deciding upon the hefty casting cost, they gave it a 7/7 body to ensure that the creature would be worth the cost regardless of the board state. Finally, they added the clause that the card had to be cast from hand to trigger the effect, to avoid any reanimator shenanigans. Location: A huge Sun Empire temple. The predominant colors of the temple should be white and gold. It is dawn, and we see the sun shining straight through the temple—from the horizon in the background through the big arches to be a bright light on the foreground. Action: Show a huge styracosaurus. This is a dinosaur similar to the triceratops, with a large bony frill around its neck. The frill, of course, is covered with feathers, and both its feathers and its leathery hide are shades of yellow and white (stay away from anything that looks like metallic gold). The frill should resemble a sunburst. It does not wear any sort of harness, saddle, or armor. The dinosaur is emerging from the temple with bright rays of sunlight behind it creating a sort of halo or god-lighting effect. It is so large that maybe it's breaking the side of the archway as it emerges. The dinosaur should look striking and majestic, as much as possible. Mood: This dinosaur is a divine incarnation of the Sun Empire's sun-god. This Dinosaur was meant to be an unrestrained, stampeding manifestation of the sun's own glory. The illuminating background sunlight and radiant adornments were essential for it to be read as an avatar of the sun, and that was clearly captured well. One of the other key aspects of the art that may not be clear from the description here is the conveyance of this Dinosaur's destructive nature. The collateral destruction of the archway and the very ground beneath its feet that the styracosaur leaves in its wake give the visual sense of "charging 7/7" that this Dinosaur deserves.